Synchronous messaging is the main form of IPC in the QNX Neutrino RTOS. In QNX Neutrino, a server thread typically loops, waiting to receive a message from a client thread. As described earlier, a thread—whether a server or a client—is in the READY state if it can use the CPU. It might not actually be getting any CPU time because of its and other threads' priority and scheduling policy, but the thread isn't blocked. Figure 1. Changes of state for a client thread in a send-receive-reply transaction. Figure 2. 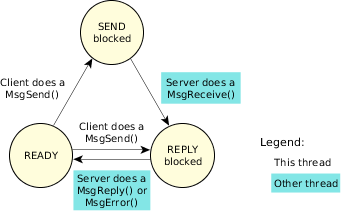 Changes of state for a server thread in a send-receive-reply transaction. Data-queuing capabilities are omitted from these messaging primitives because queueing could be implemented when needed within the receiving thread. The sending thread is often prepared to wait for a response; queueing is unnecessary overhead and complexity (i.e., it slows down the nonqueued case). As a result, the sending thread doesn't need to make a separate, explicit blocking call to wait for a response (as it would if some other IPC form had been used). Note: Note that in a network, a reply may not complete as "immediately" as in a local message pass. For more information on network message passing, see the chapter on Qnet networking in this book.